On this page, after explaining the mechanism of bonding and the process of ultrasonic bonding, we will introduce how adwelds deals with ultrasonic bonding. Not only applying “load” and “heat” to metal, but also to an object would create deformation and reduce the metal/object to the “interatomic spacing” level . 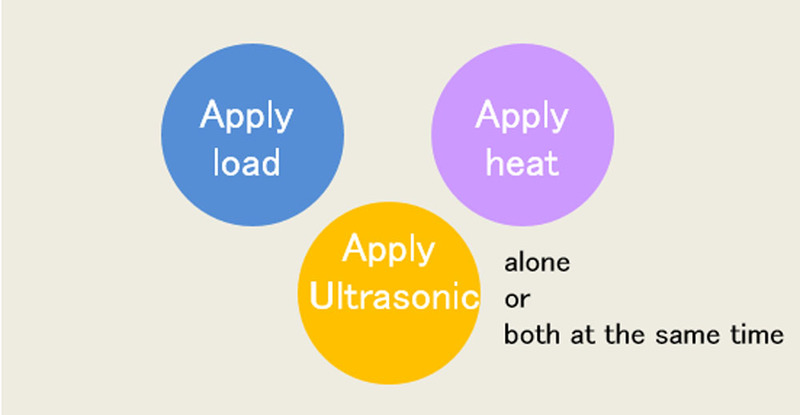 Applying only load or heat also breaks down the metal/object to the “interatomic spacing” level . Above all, applying ultrasonic is the most efficient way to reduce the metal/object. This is what we call the “ultrasonic bonding method.” Ultrasonic alleviates load and heat conditions when bonding. Why is it effective to bond when the metal/object reduce to the “interatomic spacing” level? 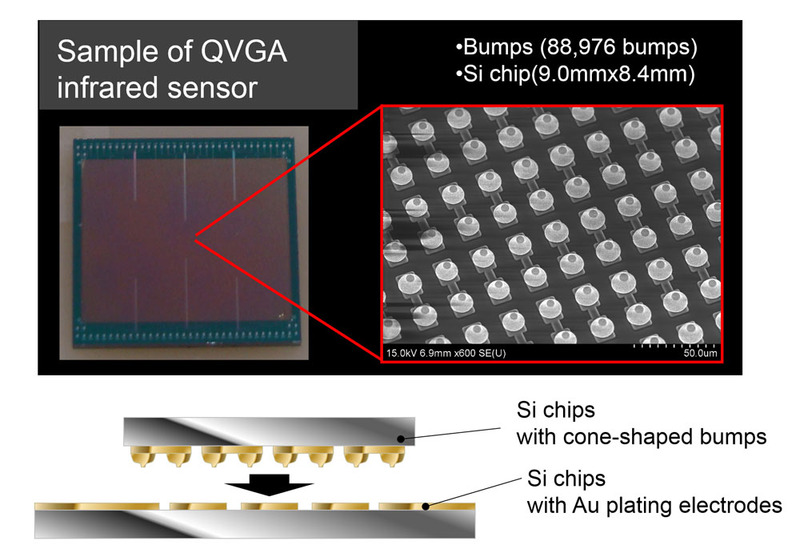 Diagrams below show ultrasonic processes how ultrasonic rigidly bonds applications without dissolving them. Step 4 The interface deforms when pressure is applied, but ultrasonic accelerates the deformation and the bonding area spreads. Therefore, two applications bond together without using heat with strong rigidity. 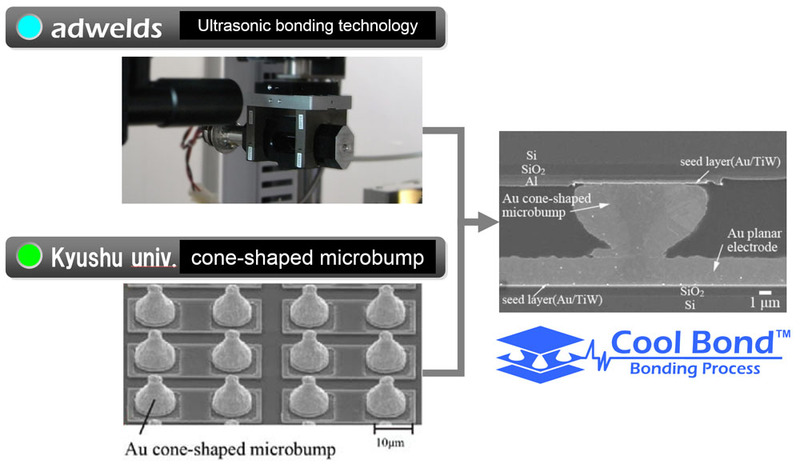 This is a process developed together with Kyushu University an advanced ultrasonic technology, which bonds application at room temperature. Fusion technology that consist of adwelds’ ultrasonic bonding technology and Kyushu University’s compliant micro bump technology. What field can this technology apply to? When bonding Cu electrodes on the printed circuit board, it required soldering process. In order to increase reliability under high temperature, developing a technology of solderless direct bonding was on high demand. 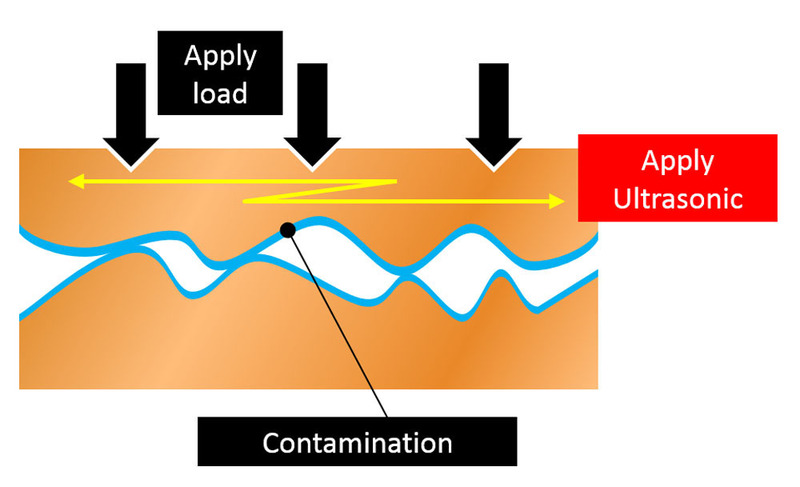 However, the ground of electrode is made of plastic resin that is soft; as shown in the diagram on the right, and damages were made on the Cu foil. Adwelds developed a technology that bonds applications via a binder, a metal material that deforms easily such as Al. By using a metal binder, it stabilizes the bonding process without damaging electrodes on the printed circuit board. The conventional process put applications on top of each other, so the welding part gets thick. Applications that are difficult to weld when the welding part gets thick, needed to take measures. adwelds found a solution to this problem, the ABB Process: Place two applications as shown in the diagram and weld the binding materials; such as Al foils. The thickness of the welding part is the thickness of Al foils.